Q: How do assign my own onclick events to menu options for the dhtml menubar? I want do more than just redirect to an href. Q: I have a horizontal menu. The top-level has icons and text. I want the text to appear under the icon image, centered. Is there a way to do that? Q: Does Deluxe-Menu work on .ASPX pages. Actually, I have got them to but the icons don’t appear. This may just be a path issue but I don’t see anything on your site saying that it will work with ASPX.Please let me know. 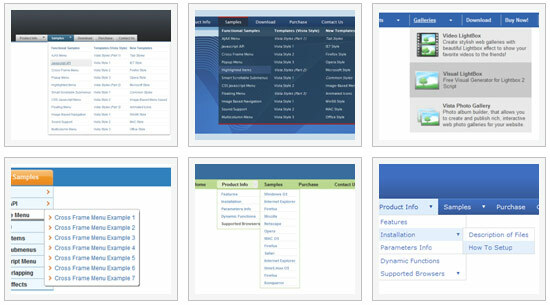 A: Deluxe Menu works fine on .ASPX pages. 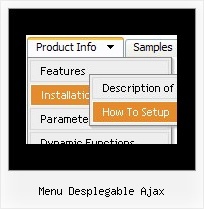 You should install Deluxe Menu on the .aspx page in the same way asyou install it on the html page. Q: I can not figure out how you put the arrow that shows there's more information in the php drop down menu? I tried and tried to figure it out where you add this .gif file? //Normal and mouseover arrow images for top-level items. // Normal and mouseover arrow images for submenu items. Open 'Icons' section in the main window and set var arrowImageMain and var arrowImageSubparameters.